[DANA POINT, CA] — KLOS Presents Sabroso Craft Beer, Taco & Music Festival is pleased to welcome the Gringo Bandito Chronic Tacos Challenge competition to Dana Point, CA for the 4th annual festival on Saturday, April 8. The highly acclaimed professional taco eating contest consists of 10 professional eaters from around the world, competing for cash prizes and the highly-coveted title of Gringo Bandito Chronic Tacos Eating Champion! 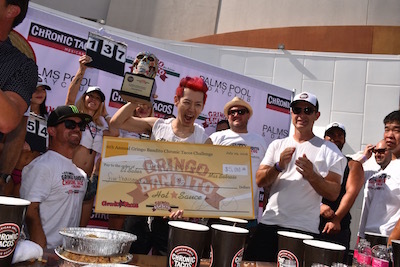 The Gringo Bandito Chronic Tacos Challenge brings together top professional eaters from around the world to test their skills and speed at taco eating. Among the 10 professional eaters is well-known world-champion eater Takeru Kobayashi, from Nagano, Japan. Kobayashi holds eight Guinness Records for competitive eating and will be defending his record from 2015, when he succeeded in devouring 144 tacos in 10 minutes. 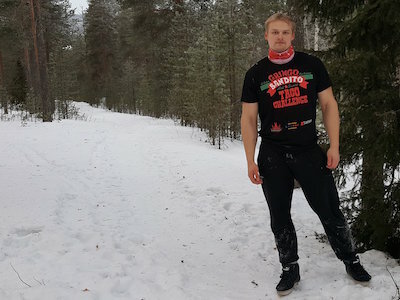 The 7th annual Gringo Bandito Chronic Tacos Challenge also welcomes defending European taco challenge champion Jesse Pynnönen, from Heinola, Finland. Pynnönen, who is said to look like a Viking and eat like a polar bear, is thrilled to have the opportunity to defend his title internationally. "I'm very competitive," comments Pynnönen. "I will train for over 2 months for this competition and will push my body to its furthest limit." Additional professional eaters include Molly Schuyller, Naader Reda, Kevin Ross, Erik Lampkin, Dave Brunelli, among others. Want to test your own skills at taco eating? An amateur competition will be open to 8 lucky contestants. In addition to eating contests, gourmet taco sampling, and unlimited craft beer sampling, event-goers are sure to enjoy spirited games, engaging attractions and the crowd favorite lucha libre style wrestling matches. Attendees are also invited to sample all flavors of The Offspring lead singer Dexter Holland's top rated hot sauce — Gringo Bandito! Festival General Admission Tickets start at $60, and VIP Lounge + Early Entry Tickets are $99. Day-of Festival General Admission Tickets (if available) will be $75 per person. 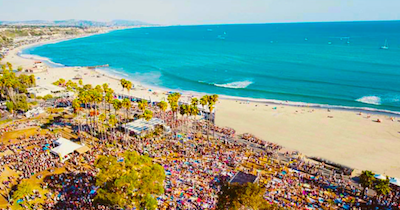 The 4th annual ultimate taco and craft beer celebration, KLOS presents Sabroso Craft Beer, Taco & Music Festival, powered by Gringo Bandito, will take over the picturesque Doheny State Beach in Dana Point, CA on Saturday, April 8 from 1 p.m.-9 p.m. (VIP opens at noon). The 21+ only, fan-favorite event comes courtesy of Brew Ha Ha Productions and Synergy Global Entertainment (SGE) and will feature the festive combination of live music from The Offspring, Sum 41, Lit, Rival Sons, Unwritten Law, and Metalachi. The festival also includes spirited games, Sabroso's famous luchalibre style matches, unlimited craft beer tastings, incredible $3 gourmet tacos from some of the region's top chefs and restaurants, and of course, the world-famous Gringo Bandito Taco Challenge. Synergy Global Entertainment, Inc. (SGE) is one of the world's premier music festival production companies. With hundreds of live events worldwide each year, SGE works with agencies, brands and musical talent to produce or co-produce concerts across various genres and interests. SGE produces Funny Or Die's ODDBALL Comedy And Curiosity Festival. In addition, SGE co-produced the Rockstar Energy Drink Mayhem Festival and the worldwide Rockstar Taste of Chaos, produced the Rockstar Energy UPROAR Festival and conceived and developed KNOTFEST with Slipknot and 5B Artist Management. SGE has also produced many other national festivals and tours. SGE senior staff have a combined 60 years of experience in artist management, large scale festival production and brand integration and have worked with artists as diverse as Guns N' Roses and The Cure. SGE excels at integrating brands' needs with large scale musical entertainment. Brew Ha Ha Productions (BHHP) is Orange County, California's most successful craft beer event producer. Its team brings years of successful event production and business experience along with an inside view of the craft beer industry and its enthusiasts. Fueled by a desire to promote craft beer, along with a vision of a different kind of beer fest, the Orange County Brew Ha Ha Craft Beer Festival was conceived. BHHP is known best for their events like the Orange County Brew Ha Ha, Brew Ho Ho 'Holiday Ale Festival', Sabroso 'Craft Beer & Taco Festival' and the Brew Hee Haw at the OC Fair. Brew Ha Ha has been voted "BEST Craft Beer Festivals in Southern California" six years in a row by the Orange County Beer Society. Brew Hee Haw Craft Beer Festival was honored in 2016 with a First-Place Western Fairs Association Achievement Award for best Event Within an Event. In six short years, BHHP has enjoyed unprecedented growth making them the largest craft beer event producers in Orange County and one of the largest on the west coast. KLOS The Rock of Southern California (95.5 FM) is a commercial Rock music formatted radio station in Southern California broadcasting to Los Angeles, Ventura, Riverside, San Bernardino, and Orange Counties. KLOS features specialty music shows such as Frosty, Heidi & Frank, Jonesy's Jukebox, Full Metal Jackie's Whiplash, Check I…2, and many more. Owned by Cumulus Media, KLOS studios are in Culver City, CA and the station reaches an audience of over 1.5 million listeners each week. Chronic Tacos is a California-inspired Mexican grill that celebrates authenticity and the individuality of its customers. The fast-casual franchise is known for its fresh Mexican cuisine that is customized for each guest's distinctive taste. Founded in 2002, the Aliso Viejo, California-based company has more than 40 locations operating across North America and is committed to serving only the highest quality ingredients and all-natural meats. Chronic Tacos offers traditional Mexican items such as tortas, taquitos, flautas and tacos as well as burritos, tostada bowls and salads, including a breakfast menu all day. Customers can choose from vegetarian and gluten-free options, as well as carne asada, polloasado, carnitas, and al pastor. Seafood lovers can also order grilled, beer-battered or Baja style fish and shrimp. Each restaurant incorporates original art designs inspired by traditional "Day of The Dead" art, creating a unique experience at each location. For more information or to find the nearest Chronic Tacos, visit www.chronictacos.com.